'Suits, Flying, 1930 pattern, collars, fur, Type A'. Stores reference 22c/298. Size 3. Removeable collar used with the 1930 pattern 'Battle Of Britain' flying suit. 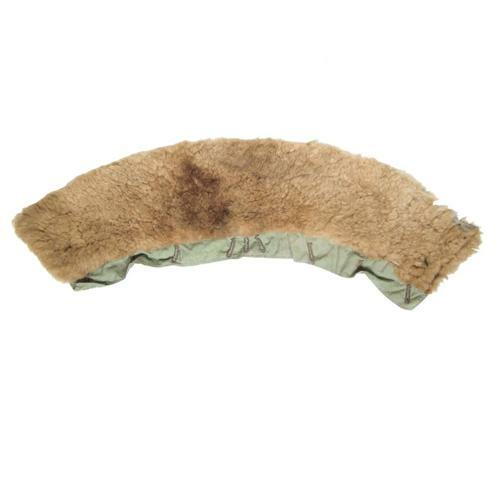 This example has good soft dense mid brown coloured fur on the same rubberized cotton backing from which the suit is manufactured. Shows light use & wear with minor moulting to the upper right edge. With faint Air Ministry King's crown and size marks. The fit of these collars is not an exact science and sometimes collars with the same markings differ in size. In our experience most collars will fit at least one size either way of that indicated. This will also fit the 1940 and 1941 pattern suits. Good '+' overall condition. Stock code S13088.